When I first started thinking about the brewpub vs. production brewery question, I had no intention of turning it into a series of posts. You can find the earlier ones here and here. 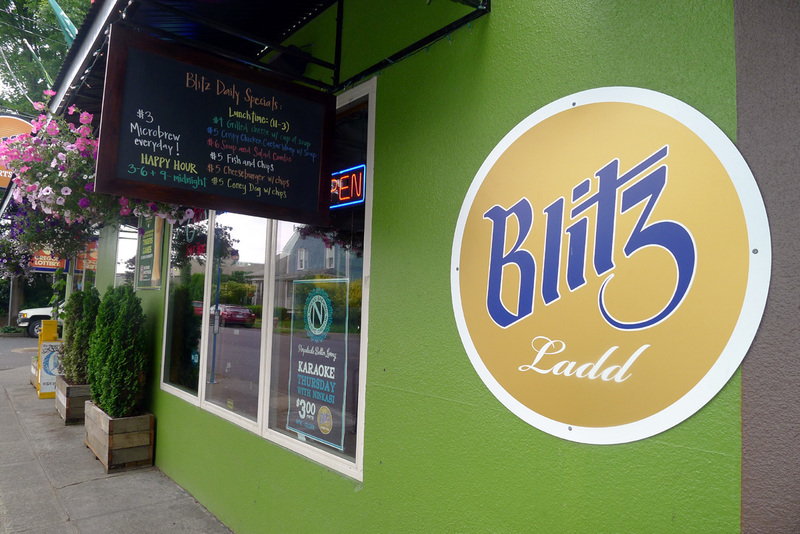 I'm addressing the question again because I stumbled onto something that generated some additional thoughts..
What happened is I visited one of the Blitz Sports Pubs...in this case Blitz Ladd down on Southeast 11th Avenue. I did not venture there to further research the brewpub question. Nope. I stopped in because I wanted to check out the space, the beer list and the food. Just another adventure. In case you aren't aware, there are currently four of these joints in or near Portland. Besides the one I visited, there are two in Northwest (Blitz Pearl and Blitz 21)and another one in Tigard (Blitz 99W). Blitz Ladd is the second location. Blitz Pearl is the original. I initially thought the Blitz chain was headquartered outside Oregon. These are large spaces, (Blitz 21 is evidently smaller than the others) and they've made a substantial investment in the brand identity. But the Blitz chain is locally owned. And they are expanding. 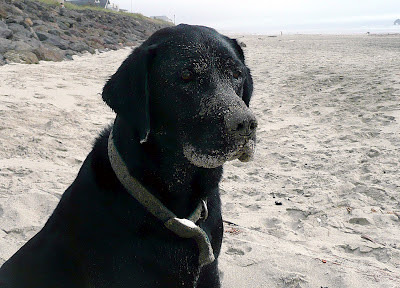 Someone I know in the biz tells me Blitz has plans to open in Beaverton and in the Hollywood District. I'll get back to that shortly. These places offer plenty of distractions. They've got gaming galore (ping-pong, shuffleboard, Foosball, video games and more). Large, wall-mounted TVs dominate the visual decor. The menu is standard pub fare and, more importantly, the beer list is damn good. Blitz Ladd has 36 taps pouring mostly great beers. These Blitz pubs may offer the perfect platform on which to mount the argument that production breweries may, indeed, be the wave of the future in craft beer. Over the course of the last few years, we have seen an increasing number of places large and small that feature great beers. Now we have the Blitz chain and Buffalo Wild Wings, both enormous operations, hawking great beer. The proliferation of places that serve craft beer not brewed in-house has implications for the industry. It will potentially help production breweries and hurt brewpubs. How so, you may rightfully ask. The $6 Blitz burger with fries. First, places like Blitz add to the plethora of opportunities for production breweries to sell their stuff. They are jumping into space already occupied by bottleshops, dive bars, bowling alleys and taprooms. This is to say nothing of the grocery and convenience store channel, which is growing exponentially in Oregon and elsewhere. Today's production breweries have nearly unlimited markets. Of course, brewpubs have the same access...but many don't have the brewing capacity to fully tap it. 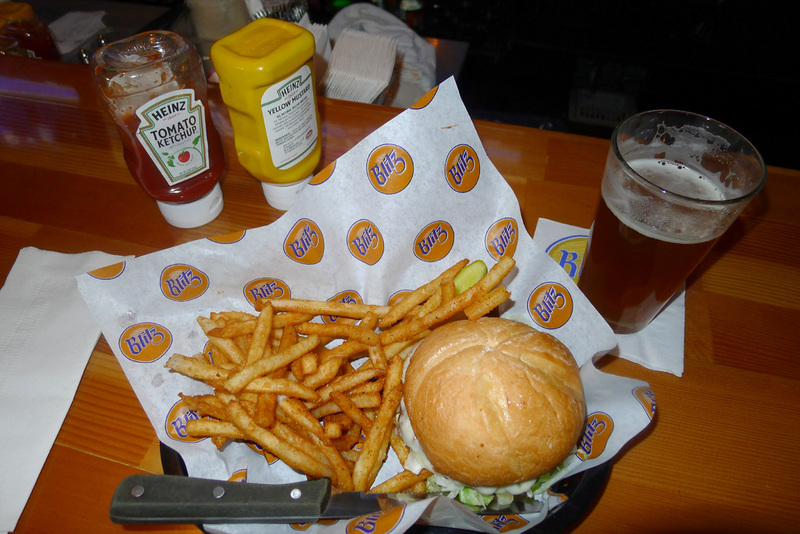 Second, and more importantly, large pubs like Blitz may sap business away from brewpubs. 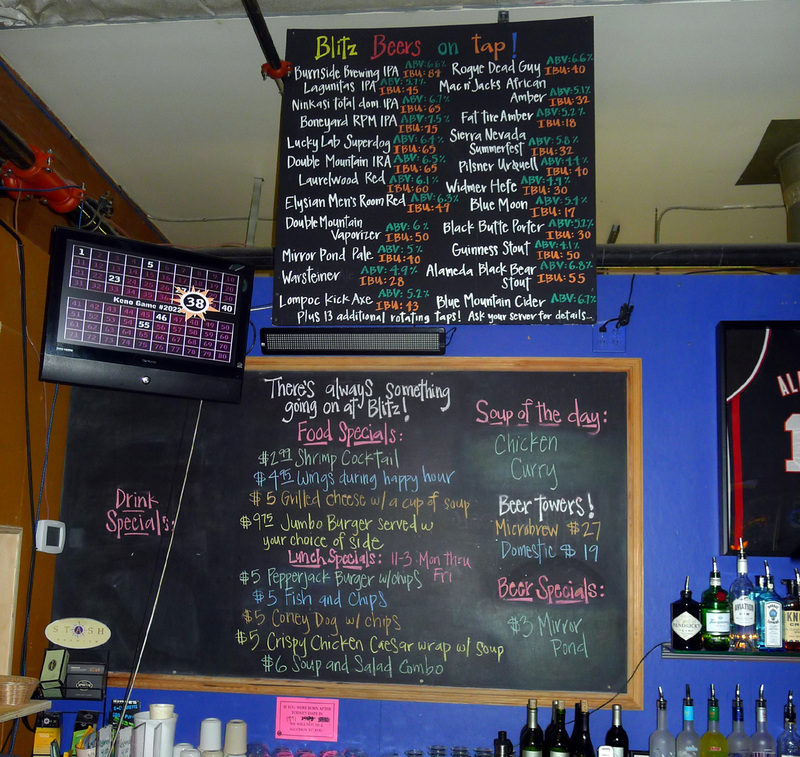 They offer a greater variety of beers in the company of a comparable menu. There's also the fact that Blitz, (Buffalo Wild Wings, too) offers gaming and entertainment amenities you aren't going to find in your average brewpub. 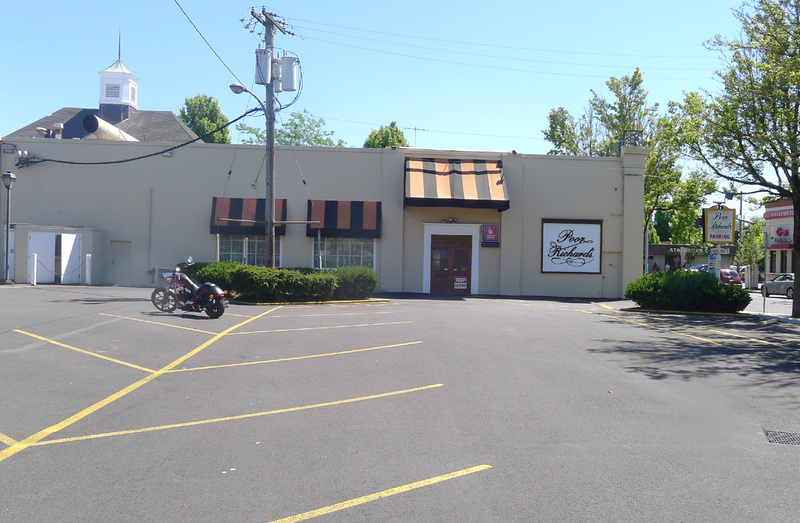 These folks are offering a seriously viable alternative to the brewpub. Consider this. The rumor mill says Blitz is working a plan to take over the former Poor Richards in Hollywood. This area is bursting with positive energy. The nearby Hollywood theater will soon get a new marquee and there's construction happening next door. It's a hot strip. Sweetening the pot for Blitz is that the Poor Richards location has plentiful off-street parking. There are brewpubs in the area. Columbia River Brewing is to the east across the street on 40th Avenue. The Laurelwood flagship is up the street on Sandy. Alameda Brewing and Fire on the Mountain are a short distance away on Fremont. Does anyone think a Blitz Sports Pub in the area isn't going to have an impact on those businesses? It occurs to me that the Blitz Sports Pubs are merely part of the evolution of the craft beer movement. Ten years ago, people who wanted good beer found it almost exclusively in brewpubs. Today, the ground has shifted. People now know what good beer is...thank the brewpub model for that. They know they don't want Bud or Coors. Instead, they demand good beer wherever they go. Blitz, along with other large and small venues, is simply tapping into the fact that craft beer has an established following. We'll have to wait and see how this pans out. If you go out to Yelp or any of the other places where people comment on pubs and restaurants, you'll find Blitz pubs aren't getting the greatest marks for food or service. Some brewpubs are in the same boat, but I suspect Blitz needs to clean up its act if it's going to compete with the better brewpubs for the better customers. I'm working up some thoughts on strategies the brewpubs and smaller breweries are using or are likely to use to ensure that customers continue to come through their doors. The brewpub is certainly not dead. Next week. 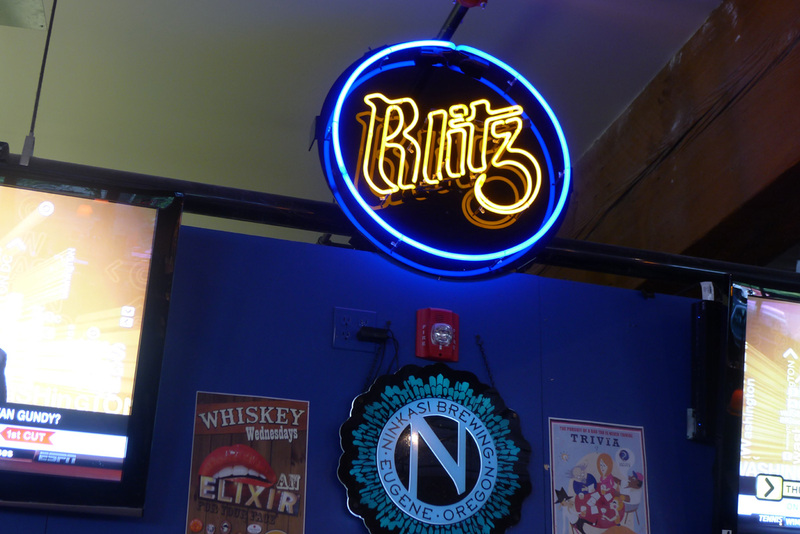 For me Blitz will never compete for the business I take to breweries and brewpubs. However, they do serve a purpose: football season. I can count on them (Ladd especially as it's closest to me) to be open for the first game, to have decent (not great) food, to have a decent (not outstanding) tap selection and to be showing all of the games on their TVs. Here are some thoughts from the square state in the middle that is on fire [Colorado]. I notice local brewpub growth 2011 v. 2010 was very modest; 05 of 06 [reporting] grew less than 04%. In contrast, local breweries grew: 65%, 63%, 58%, 49%, et cetera. Brewpubs have the advantage of selling their beer directly to the public; no second or third party to demand a profit. And, without the 'burden of packaging and labeling', brewpubs have the advantage of offering many, many beer style in the course of a year. Eg, Mountain/Southern Sun [sister brewpubs in Boulder] and Pumphouse [Longmont] produced 70+ and 40+ distinct beers in the last couple of years. Combination of a beer with different fruits with/without wood-barrel-aging with/without souring amp up the numbers. Another variation on the theme are taphouses/taprooms; a bar within a restaurant with 20+ craft/artisan/authentic beer. No games, few if any TVs; just good food and good beer. I have seen taphouses described as the "farmer's market" of [beer] tavern / beer bars. Taphouses have the advantage of offering 20+ quality craft/artisan beer from whatever US or foreign breweries they can access. Taphouses have the disadvantage of not being allowed to join state or national brewer guilds and benefit from their advocacy and advertising [as far as I can tell]. Kris, an industry person I respect recently told me his and my opinion didn't matter. Why? Because we aren't the average beer consumer. He was exactly right. Like you, Blitz is never going to get much of my business. I totally get the football angle...and I may head down there to see what it's like on an NFL Sunday. But that's not the point. The point is they are going after a different demographic than you and me. They want the younger, game-oriented demo...and the tap list is perfect for those folks. I'll be interested to see what happens when they open Blitz Hollywood. Jack, thanks for the comments. Damn, I hope they get those fires under control. I feel for Colorado. Those brewpub vs. brewery stats are interesting. I suspect breweries are showing big growth because places like Blitz are out there. More and more places for breweries to sell their beer. And Blitz can offer a great list of beers without making any investment in brewing infrastructure or overhead. As noted at the end of that post, I'll soon offer some thoughts on what brewpubs will do to maintain their customer base. They are not dead. I continue to think about 'Leaving the Brewpub Model Behind'. I surmise 'production breweries' [sited in light industrial estates] are viable in a mature craft beer town such as Boulder, et cetera. I have eaten/drank beer at brewpubs in two small town [11,000 and 21,000 :population] on the I-80 in Wyoming. I would not have planned my overnight stop for a modest production brewery. This supports the Calagione brewpub model. I spent 08 hours Saturday helping the 40something founder of a soon-to-open production breweries sited in Boulder light industrial estates. The founder plans to sell his beers on draught at and in bombers and growlers from the taproom and in bombers at local beer emporium. No plan for kegs to restaurant, et cetera. - he does not want to deal with the 6 pallets minimum order of cans; he reported 2 pallets is the minimum order of 22 oz bottles. Note: I deleted and reposted my comment of 921p, 30 June 2012 to remove the brewery's identity.